Putin, Man of Mystery? Hardly. Mark D. Steinberg is Professor of History at the University of Illinois at Urbana-Champaign. He is the author or editor of books on Russian popular culture, working-class poetry, the 1917 revolution, religion, and emotions. His most recent books are Petersburg Fin-de-Siecle (Yale University Press, 2011) and the eighth edition of A History of Russia, with the late Nicholas Riasanovsky, published by Oxford University Press in 2010. He is currently writing a history of the Russian Revolution. No less revealing is his reflection on the relationships uniting the diverse peoples of Russia. How Russians have often understood their history as an “empire” (though the word is no longer favored) pervades these words and Putin’s thinking. Putin himself has a lot to say about history in his March 18 speech. He points, as he often has, to the recent history of humiliation and insults suffered by Russia at the hands of “our western partners” who treat Russia not as “an independent, active participant in international affairs,” with “its own national interests that need to be taken into account and respected,” but as a backward or dangerous nation to dismiss and “contain.” Worse, the Western powers seem to believe in their own “chosenness and exceptionalism, that they can decide the fate of the world, that they alone are always right.” Rulers since Peter the Great have been fighting for Russia to be respected and included, and generally along the same two fronts: proving that Russia deserves equal membership in the community of “civilized” nations through modernizing and Europeanizing reforms, and winning recognition through demonstrations of political and military might, “glory and valor” (in Putin’s phrase). That Russia was famously disgraced during the original Crimean War, revealing levels of economic and military backwardness that inspired a massive program of reform, and that Western commentators now are expressing surprised admiration at the advances in technique and command seen among the Russian army since it was last seen in the field in Georgia, is not only surely gratifying to Putin (who has made military modernization a priority) but part of an important story about nation and history. Putin also has a lot to say about empire. In the nineteenth century, a theme in Russian thinking about empire was that Russians rule the diversity of its peoples not with self-interest and greed, like European colonialists, but with true Christian love, bringing their subjects “happiness and abundance,” in Michael Pogodin’s words. As Nicholas Danilevsky put it in 1871, Russia’s empire was “not built on the bones of trampled nations.” The Soviet version of this imperial utopianism was the famous “friendship of peoples” (druzhba narodov) of the USSR. 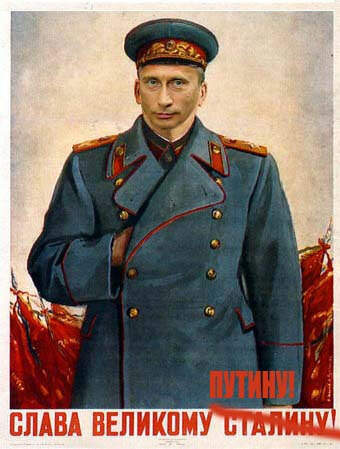 Putin, we see, echoes this ideal. 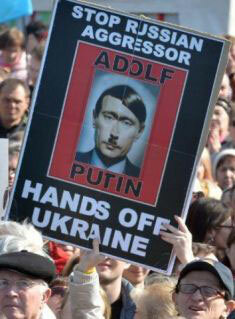 He also directs it against ethnic nationalisms that suppress minorities (above all, Russian speakers in Ukraine). Hence his warnings about the role of “nationalists, neo-Nazis, Russophobes, and anti-Semites” in the Ukrainian revolution, and his declaration that Crimea under Russian rule would have “three equal state languages: Russian, Ukrainian, and Crimean Tatar,” in deliberate contrast to the decree of the post-Yanukovych Ukrainian parliament that Ukrainian would be the only official language of the country (later repealed). Putinism often tries to blend contradictory ideals—freedom and order, individual rights and the needs of state, multiethnic diversity and national unity. Dismissing these complexities as cynical masks does not help us develop reasoned responses to Putin. Most important, it does not help people in Russia working for greater freedom, rights, and justice, who are marginalized (and often repressed) when Russia feels under siege. “We have every reason to argue,” he warned in his March speech, “that the infamous policy of containing Russia, which was pursued in the 18th, 19th, and 20th centuries, continues today. They are constantly trying to sweep us into a corner.” Of course, Putin is not wrong to speak of Western arrogance toward Russia (though he is hardly a model of respect for international norms) nor to warn of the dangers of intolerant ethnic nationalism (though he looks the other way at Russia’s own “nationalists, neo-Nazis, and anti-Semites”). That he can be hypocritical and cynical does not mean his thinking and feelings are “empty,” much less that he has lost touch with reality or with the views of most Russians.